The Ripley Wolves couldn’t move up in the standings on Saturday night, as they lost 7-3 to the Saugeen Shores Winterhawks. A full report will be posted to this site once details become available. The Wolves finish the season in fourth place and will have home ice advantage against the Durham Thunder Cats in the first round of the playoffs. Durham has the advantage of the season series, winning two games to Ripley’s one (although one was in a shootout). Games will start next weekend in Ripley, though a schedule has yet to be determined. Watch ripleywolves.com for updates. The Ripley Wolves have their fate in their own hands heading into the final weekend of the regular season. The Wolves, who sit in fourth place, two points behind the Saugeen Shores Winterhawks in the North Division, play their final home game of the regular season on Friday, Jan. 25, at 8:30 p.m., against second place Shelburne. They then travel to Port Elgin to face the Hawks on Saturday night. With two wins over the Winterhawks already this season, any tie-breakers should give Ripley third overall and a likely first round date with Shallow Lake. The fourth place team will likely face the Durham Thunder Cats in the first round. The Thunder Cats will be a huge test for any team, and they proved as much on Saturday night when they defeated the Wolves 2-1 in a shootout. Paul Stewart opened the scoring early in the second, from Ryan Armstrong and Brian Stanley. Durham wouldn’t tie it up on goalie Kurt Edwards until five minutes into the third, which ended the scoring. The final home game on Friday night is a big night for the Wolves, as we induct the first five members onto our Wall of Fame. Brent Armstrong, Bill Patterson, Mark Stanley, Rick Smith and Glen Wylds will be honoured for the roles they’ve played in making the team a success prior to and since the team returned to the league 10 years ago. The ceremony will be held prior to the drop of the puck, so plan to be at the game early and be sure to congratulate these very deserving recipients in the Wolves Den during and after the game. The game is also our Sponsor Appreciation Night, so join us in thanking the community members and business owners who allow this team to be a success on and off the ice. The Ripley Wolves are celebrating their 10th year since returning to WOAA Senior ‘A’ hockey by honouring five people who have been integral to a decade of team success. 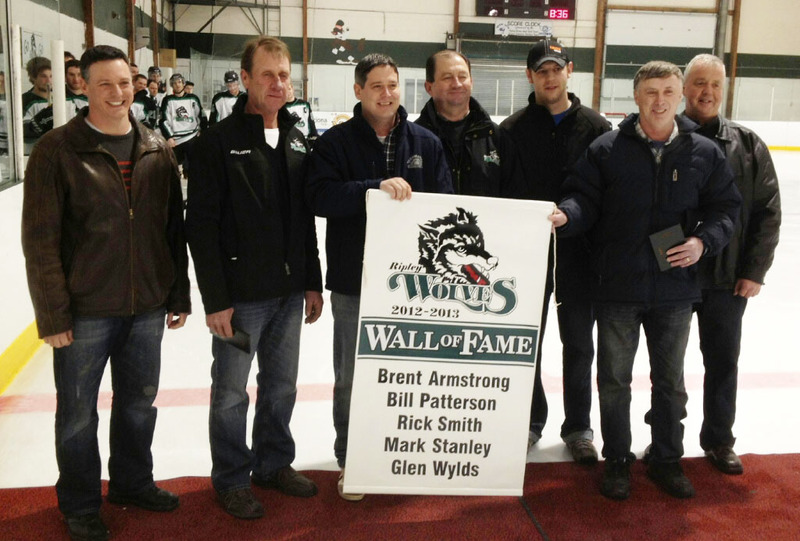 The first inductees onto the Wolves Wall of Fame are Brent Armstrong, Bill Patterson, Rick Smith, Mark Stanley and Glen Wylds. A ceremony will be held and banner raised in their honour at the Wolves’ next and final home game of the regular season, on Fri., Jan. 25, at 8:30 p.m. The game, which is also Sponsor Appreciation Night, is against the Shelburne Muskies, who the Wolves are battling for second overall. Kevin Taylor, President of the Wolves executive committee, said the individuals being inducted onto the Wall of Fame have been important members of the team from the 1980s through the late-90s, and since the Wolves’ revival in 2002. Armstrong was one of the best players ever to play in the former Intermediate, Senior B and Senior A leagues. He is the Wolves’ all-time team leader in career goals (258), assists (306) and points (564) in 247 games. He also thrived in his 144 playoff games with 127 goals and 168 assists for a stunning 295 points. He has continued to commit himself to the team, currently serving as the head coach. Patterson ranks seventh in Wolves’ all-time scoring with 87 goals, 162 assists for 249 points in just 185 games, while potting 19 goals and 43 assists for 62 points in 76 playoff matches. Later in his career, Patterson moved to Goderich and played for the Pirates, but gave up an opportunity to compete for a championship to return as captain of the fledgling Wolves when they returned to the league in 2002. His leadership and dedication set an example for his teammates and players that followed. Stanley is the team’s leader in games played with 250, where he put up 89 goals and 137 assists for 226 points, with another 86 points (32, 54) in 144 playoff games. His commitment to senior hockey in Ripley has seen him end up behind the Wolves bench as an assistant coach. Smith and Wylds were the driving forces behind returning the Wolves to the league and respectability. They volunteered countless hours organizing the team’s revival, recruiting players, building a strong executive committee and ensuring the team’s success for the next decade. Smith served as General Manager until the 2010 season, while Wylds spent years as team president, building a foundation for the executive committee that has ensured continued success after 10 years. The Wolves invite the entire community to their home game on Jan. 25 to celebrate the Wall of Fame inductees, and stay to cheer the Wolves on as they fight for playoff positioning with their rivals from Shelburne. The Ripley Wolves’ time in second place lasted less than 24 hours. After catching the Shelburne Muskies in the standings after Friday night’s win, the Wolves needed to beat last place Lucknow to keep pace for second overall in the WOAA Sr. A North Division after the Muskies beat Durham in overtime Saturday night. With 24 points separating Ripley and their cross-township rivals, this shouldn’t have been a problem. But Lucknow gets full credit for playing the spoiler in a 5-4 win on their home ice. The game was tight throughout, entering the third period tied 4-4. Goal scorers for Ripley were Devin Kemp, Alex MacLeod, Ryan Armstrong and Darrin MacDonald. Assists went to Blair Pollock, Tyler deVos, Chad Colling, Kenny Stanley, Mark Stanley, Armstrong and MacDonald. Tom Church took the loss in the Wolves net. The Wolves will continue to battle for playoff positioning this weekend, when they travel to Durham, which currently sits in fifth place, five points back of the Wolves (and four back of Saugeen Shores for fourth). Watch http://www.ripleywolves.com later this week for some exciting news about the Wolves’ final home game, on Jan. 25 against Shelburne. The Ripley Wolves moved into a tie for second place by defeating the Mapleton-Minto (Palmerston) 81’s 7-2 on Friday night, on the road. Nick Locking led the way for the Wolves with a natural hat-trick in the third period to seal the win. Brian Stanley got the Wolves on the board six minutes into the game on a powerplay, from his brother Mark and Kyle Gallant. Minutes later, the Wolves scored two within a 20-second span when Mark Stanley scored from Darrin MacDonald and Chad Colling. A few seconds later, MacDonald stretched it to a 3-0 lead with an unassisted marker of his own. Mapleton-Minto would score two minutes later, but Paul Stewart restored the three-goal lead late in the first from Ryan Armstrong and Travis VanGaver, giving the Wolves a comfortable 4-1 lead after one period. Palmerston scored the only goal of the second, but the third became the Locking show, as he potted a natural hat-trick within a four-minute span to solidify a huge two points for the Wolves. Assists on Locking’s goals went to Corey McCrae, Brian Stanley, Mark Stanley and VanGaver (2). The win moved the Wolves a point ahead of the Saugeen Shores Winterhawks for third place in the WOAA Sr. A North Division, after Port Elgin lost 3-2 to Shallow Lake. The Wolves are now tied for second overall with the Shelburne Muskies, who lost to league-leading Elora last night. Shallow Lake’s win moves them into a tie for fifth place with the Durham Thundercats in the ultra-tight standings, while Palmerston doesn’t look like they’ll move out of seventh place before the season ends on the Jan. 25 weekend. Lucknow is a distant eighth and will face Elora in the first round of the playoffs on the Feb. 1 weekend. The Wolves travel to Lucknow tonight for an 8 p.m. puck drop, while Shelburne hosts Durham. Watch http://www.ripleywolves.com for a recap of the team’s fourth-last regular season game.